Posted on August 11, 2017 by treelawyer	tagged. From the hatcheck to the parking lot to the dry cleaner to the amusement park, we grant pre-injury waivers of liability all the time. And we’re helpless to stop it. Don’t believe us? Try negotiating that fine print on the back of your parking lot ticket next time you leave the Mercedes in the hands of some teenager named “Kent Steerwell.” You’ll be handed your keys, probably with a suggestion of where to put them (and it won’t involve inserting them in the ignition, either). It’s still in the 80s at 8 p.m. as we write this, so it’s a nice escape to think about skiing. Here goes: When expert Alpine skiing enthusiast Bill Rothstein parted with his hard-earned cash for a couple of souped-up passes to the Snowbird resort (your basic pass and a special one that let him skip lines and not have to mingle with the great unwashed), he signed the waivers without a second thought. You know, the ones that said the resort wasn’t liable for a ding-dong thing in case he got hurt. While skiing the “Fluffy Bunny” run (hardly sounds like a double-diamond course, does it?) Bill ran into a poorly-marked retaining wall and messed himself up but good. Fortunately, his favored hand wasn’t injured, so he quickly signed off on a lawsuit against the ski operator. But the trial court was impressed by the breadth of the release Rothstein had signed — as tall as the Wasatch and as wide as the Bonneville Salt Flats — and it threw the case out. The Utah Supreme Court saved Rothstein’s bacon. It held that, no matter what the pre-injury waivers said, Utah public policy required that ski resorts take responsibility for the results of their negligence. A state statute, the Inherent Risks of Skiing Act, exempted ski resorts from certain risks that are inherent in skiing — such as broken legs, frostbite, fashion faux pas — so that the operators could buy insurance against actual negligence. The Court held that inasmuch as the legislature exempted ski resorts from certain types of risks so that they could afford insurance to cover the remaining ones, it was contrary to public policy for a ski resort to try to exempt itself from liability for any negligence whatsoever. The Romans had a word for it: expressio unius est exclusio alterius, which means “the expression of one excludes all others.” This means that because the law expressly carved out certain acts from liability – such as the effects of the relentless pull of gravity – it specifically intended not to carve out other unlisted acts: like failing to adequately mark a retaining wall. 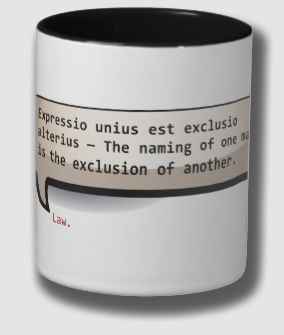 Now available – expressio unius coffee mugs! Rothstein v. Snowbird Corp., 175 P.3d 560 (S.Ct. Utah, 2007). “Fast Billy” Rothstein, an expert skier collided with a retaining wall while skiing at Snowbird Ski Resort. The retaining wall was unmarked and no measures had been taken to alert skiers to its presence. Although Snowbird had placed a rope line with orange flagging near the wall, there was a large gap between the end of the rope and a tree, which Mr. Rothstein incorrectly understood indicated an entrance to the Fluffy Bunny run. Rothstein sued Snowbird for negligence. Snowbird defended itself by asserting that Mr. Rothstein had waived his ability to sue Snowbird for its ordinary negligence when he purchased two resort passes that released the resort from liability for its ordinary negligence. The trial court thought these agreements were pretty comprehensive, not to mention dispositive. It granted summary judgment in favor of Snowbird. Quicker than you could say, “Fluffy Bunny,” Rothstein appealed. Held: The trial court was reversed, and Rothstein was allowed to sue the ski resort. The Court held that releases that offend public policy are unenforceable. 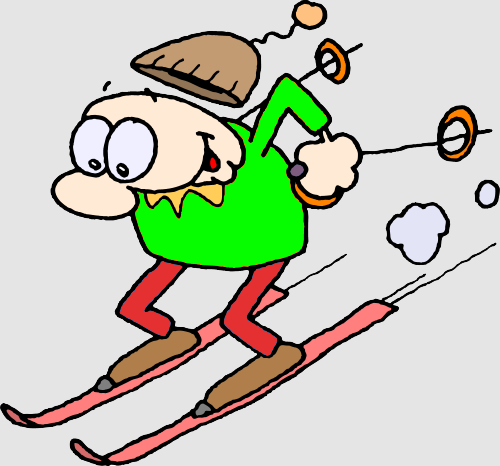 Under Utah’s Inherent Risks of Skiing Act, certain hazards inherent in skiing are defined. Resorts aren’t liable for those risks — like breaking a leg on a downhill run — thus clarifying the hazards sufficiently to enable the ski operators to by insurance against those risks that aren’t excluded. Inasmuch as the legislature had determined that resorts should insure themselves against risks not inherent in the sport of skiing, the Court held that it was contrary to public policy to permit an operator to duck liability for negligence that could have been avoided by requiring its patrons to waive claims for negligence as a condition of use.